We make it simple and affordable to enjoy year-round comfort with a HVAC System that is custom-fit to your lifestyle and budget! We install the Continental Furnace only furnace made in Canada by Wolf Steel in Barrie, ON, also makes the Napoleon Line of appliances 96% AFUE . · up to 30 feet clear condensate tubing to an open drain/sink or laundry tub. For the ultimate flexibility in home heating, look no further than Rinnai Direct Vent Gas Wall Furnaces. These innovative gas appliances deliver smart, energy-efficient and consistent warm air to any cold spot without the use of a central duct work. And installation could not be easier with a small vent termination. 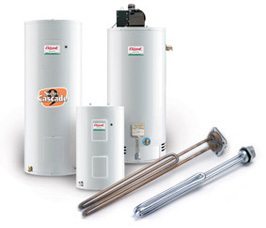 Money and energy savings over tank type water heaters and traditional water heaters. For more information on North Bay Hydro Services systems please visit us or contact Michael at (705) 474-8100 ext 267 or email mgeauvreau@northbayhydro.com for more information.